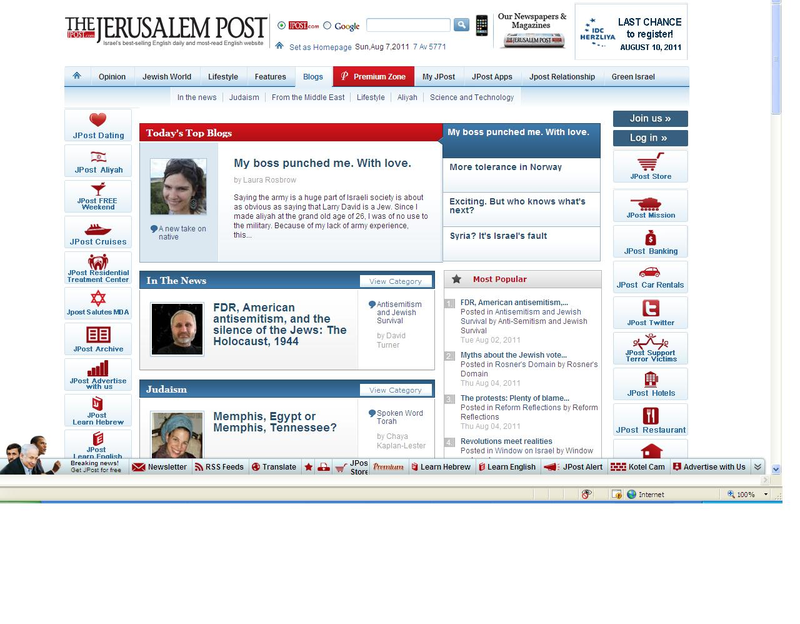 My blog is today’s top Jerusalem Post blog! As some of you may know, I started writing a personal column for the Jerusalem Post Lite in June on a trial basis. Well, it received such strong feedback that they decided to make it a permanent blog on Jpost’s website! My first post is actually today’s top featured blog! The blog is titled, “A new take on native,” and is a way for me to share my perspective on Israel as a new immigrant. Specifically, I described fresh observations that might be new or insightful to Israelis. It will be in their “aliyah” section, which refers to blogs from new immigrants. Before sharing my first post widely, I realized there were a few cultural things I needed to explain to audiences outside of Israel. 1) I use the term, “making aliyah.” This term refers to the process in which Jews outside of Israel can become citizens of the State of Israel based on Israel’s Law of Return. Some consider the Law of Return controversial in comparison to the Palestinian right of return. To be fair, I use the same source to explain both sides: Wikipedia (on an unrelated note, I am writing about Wikipedia soon because I went to their annual conference in Haifa and got to interview Jimmy Wales, Wikipedia’s founder!). At this point, I am considered a dual citizen of the United States and Israel. On a personal level, I made aliyah mostly for practical reasons: I liked living in Israel and knew that I wanted to live here for a long time. Given the option, I preferred becoming a citizen to remaining on a work visa status because it made my life easier financially as well as legally. 2) Part of becoming an Israeli citizen can mean a mandatory military service. All Israeli women under the age of 22 and men under the age of 26 are obligated to serve in the Israel Defense Force unless they go to a Yeshiva, are married, have children, have a suitable medical reason or are Arab-Israeli. Because I became a dual citizen at the age of 26, I was not obligated to do this. 3) “Sabra” is a reference to native Israelis. This entry was posted in Blog, Personal, Published and tagged A new take on native, Aliyah, Army, Funny, Jpost, New blog by Laura Rosbrow. Bookmark the permalink. Enjoyed reading this piece. This was the first we knew of your aliyah, though! Very interested to learn of your desire to live there “for a long time.” We’ll have to come and visit!